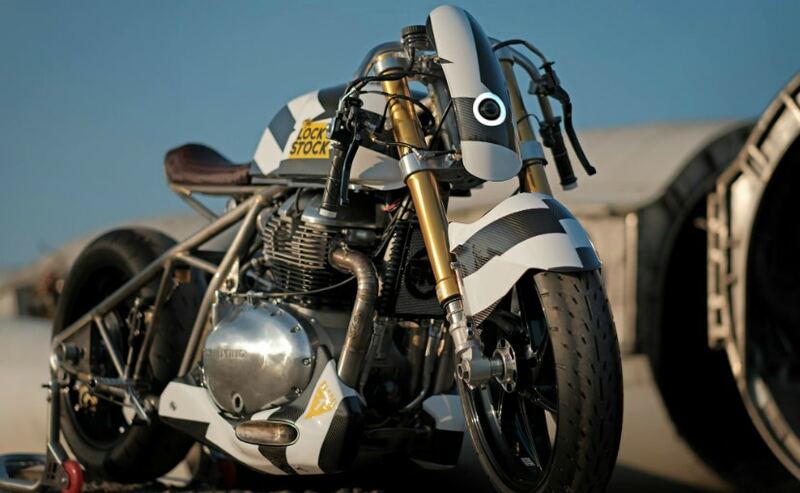 Royal Enfield unveils a custom dragster based on the new 650 cc parallel-twin engine, called the LockStock. 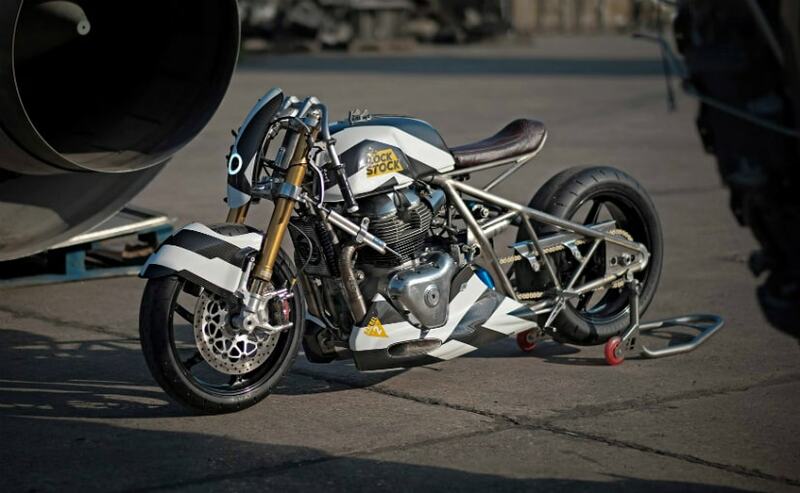 Royal Enfield unveiled a one-off custom drag bike called LockStock at an event held by The Bike Shed Motorcycle Club in London recently. While the Royal Enfield 650 twins are still sometime away from being launched in full production form, the LockStock dragster is also powered by the same, new 650 cc parallel-twin engine that will power the new Continental GT 650 and the Interceptor 650 models. 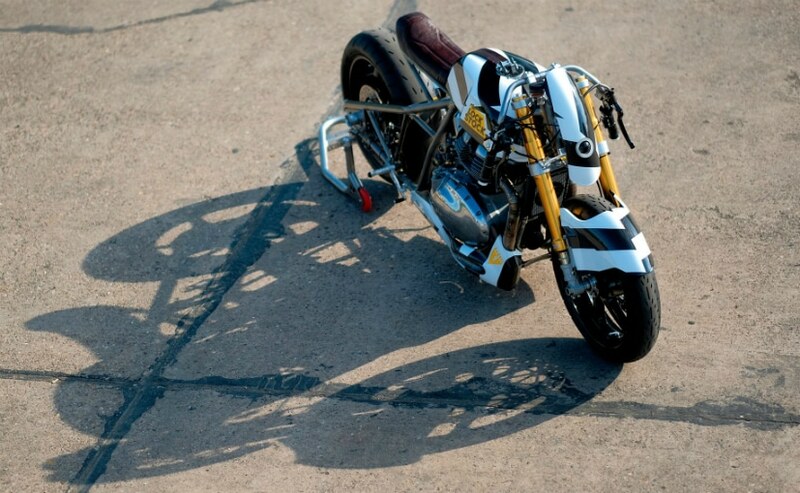 Dragsters are typically used for straight line speed, so the engine on the LockStock may have been tuned differently for more power, although Royal Enfield hasn't released any figures or details about the state of tune. Based on the same engine, the LockStock bears little resemblance to either the Continental GT 650 or the Interceptor 650, with the exception of the fuel tank, which seems to have been borrowed straight off the Continental GT 650. The other thing it shares is of course, the 650 cc engine which in standard tune generates 47 bhp of power at 7,100 rpm and 52 Nm of peak torque at 4,000 rpm. The LockStock has minimal bodywork, but features an all-new chassis, and a redesigned single saddle, along with a nitrox oxide cyinder. Also new are the drag-spec tyres, drop-bar handlebar and a unique headlight with a projector lamp and a LED ring around it. Up front is an Ohlins upside down fork and Brembo calipers gripping the front disc brake. The rear is hard-tail and there's no shock, although there's a rear disc brake as well. We suspect the LockStock will be much more powerful than the stock 650 Twins, considering the purpose it's designed for, and the addition of the NOX cylinder will likely ensure it will reach speeds which will possibly make it the fastest Royal Enfield in business.